The home was first founded in 1891 and was then known as St Joseph’s Orphanage. With the changing trends in society in the 1990’s and the rise in problems faced by families, there was pressure to expand the services of the orphanage in order to be more responsive and relevant in society. Hence St. Joseph’s Orphanage opened its doors to include not only orphans, but also to boys and girls of all religions and ethnicity who came from very poor socio-economic and psychological backgrounds. 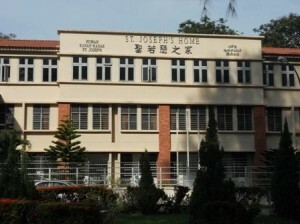 St. Joseph’s Orphanage became St. Joseph’s Home. We have 39 children (16 Boys and 23 Girls) whose ages range from 6 to 17 years, the Home is still true to its mission of seeing to the needs of poor children and helping them to get a good education and developing proper living skills so that they will become useful adults. With its mission statement being the HOLISTIC DEVELOPMENT AND REINTEGRATION OF THE CHILDREN INTO SOCIETY, the pillars of the Home are: Formation, Education, Community Life. The Home has established vocational skills training for those in the Home and outside the Home (those of poor social economic background) who are not academically inclined so that they can be independent in the future. They have also started a new programme on teaching/ learning methods to stimulate and motivate the children towards learning. This is done by activity-based learning, which is conducted in small groups of six children at the maximum. To ensure that the children are not left out in the mainstream of society, regular outings are carried out. The children are sent to public schools and regular liaison is carried out with the schools. volunteers and tuition teachers help them cope with their formal schoolwork. The Home is dependent on donations for its services. The Welfare Department of Penang gives an annual grant to the Home. However, the grant is not enough to sustain the Home. The Home welcomes all of you to be partners with them in the development of these children. Hence every contribution, both in kind and cash as well as service is greatly appreciated. Rebuilding of the Home’s dormitory, which was destroyed by fire, was funded entirely by generous donations from the Public and currently houses the girls’ dormitories. The Home requires basic foodstuff (fresh seafood and vegetables) and general cleaning supplies (household cleaners and detergents). A list of items can be viewed on the Home’s notice board. The Home also runs a program where you can sponsor a child for RM1,000/- per annum. For more information on how you can help please contact the Home. The cost of installing Solar Power is RM220,000.00 and we need to raise this sum soonest so as to fit into this years Solar Power program.